The F20 can produce 20kg of cubed ice every 24 hrs. It has a storage capacity of 6.6 kg. It offers complete temperature control and superb hygiene, which is vital because ice is given the same hygiene consideration as foodstuffs. The Foster range has been innovatively designed with new user-friendly electro-mechanical controls to ensure reliability. Settings can be adjusted on site to suit the ambient air and water conditions, making sure you achieve maximum output wherever the machine is located. The models also incorporate a condenser thermostat, which ensures a full harvest of cubes, even in low ambient temperatures. Fosterâs icecubers produce ultra cold square cubes that last longer in the glass, ice bucket and the machineâs storage bin, so less ice replenishment is required giving you an additional cost saving. The range also uses as little as 5 litres of water to produce 1 kilo of ice â important where water is metered. 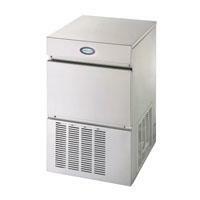 Hygiene is another vitally important factor as ice is classified as a food under food safety regulations. The new flush system ensures clear ice free from impurities and eliminates the risk of lime-scale build up. The new models feature ice storage areas that are produced from moulded food-safe plastic with coved internal corners, making them easy to keep clean.